Welcome to Part 2 of the series on unemployment in Oregon. Part 1 provided a brief overview of unemployment in Oregon, at least by the numbers. 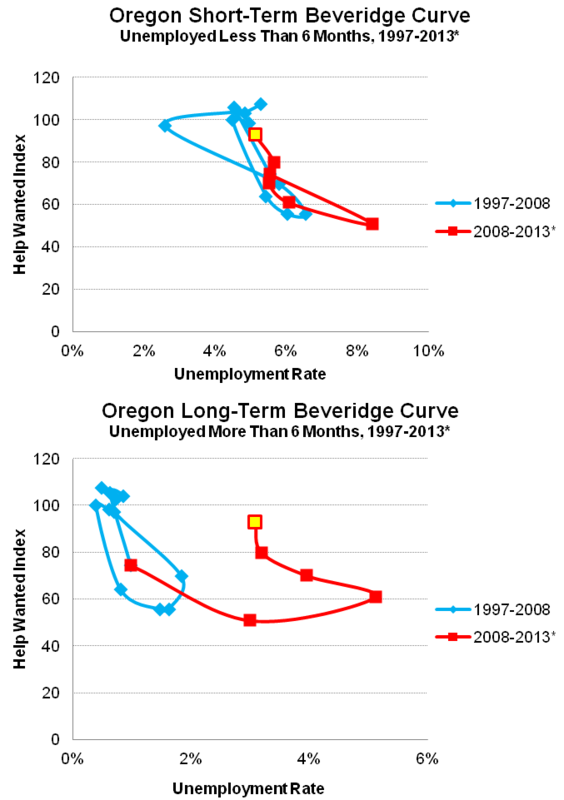 Today in Part 2 I will get a bit wonky by examining Oregon’s Beveridge Curve; in particular to illustrate the divergence in labor markets for the short-term and the long-term unemployed. Part 3 will discuss job prospects and what happens to the unemployed. There has been quite a bit of excellent, albeit depressing, research in recent months on long-term unemployment. Northwestern University PhD candidate Rand Ghayad has been at the forefront of this during his time at the Federal Reserve Bank of Boston (with co-author William Dickens) however additional studies continue to further our understanding of the labor market, including this recent field experiment on call-back rates by duration of unemployment. The same authors also just finished another paper examining the long-term unemployed, which supports the findings of Ghayad. More on these academic papers in a bit and in Part 3. For now, we know that the number of long-term unemployed has been at historically high levels, at least of recorded history, and the slowly expanding economy has not made much progress in creating enough jobs to bring the unemployment rate down quickly. However, it really wasn’t until Ghayad and Dickens’ Boston Fed research that we had the best, clear, empirical evidence of this bifurcated employment recovery between the short-term and long-term unemployed. What Ghayad and Dickens researched is the relationship between job vacancies and unemployment. Over time there has been a clear, negative relationship between these two series. During an expanding economy, with low unemployment, businesses want to hire and grow and need more workers, so job openings are higher. Given the tighter labor market it also takes more work to find qualified employees given most people have jobs elsewhere so search intensity picks up as well. During a recession, unemployment rises and job openings are scare. This relationship is called the Beveridge Curve after British economist William Beveridge and so far in recovery, in the U.S. the curve has shifted out (via BLS). This means that for any given level of job openings there is higher unemployment. This leads to the specter of structural unemployment, the dreaded labor market condition where more stimulative policies (either monetary or fiscal) aren’t able to help and only lead to higher inflation. This is the stereotypical story of the unemployed construction worker or assembly line worker unable to find a job he is qualified for — as these firms are not hiring today, or at least not much — but retraining to become a medical professional takes both a lot of time and money, so he remains unemployed. The same pattern can be seen in Oregon. Today’s unemployment rate is approximately 2.5 percentage points higher than the historical relationship would indicate given the current number of job openings. Note that given data availability at the state level, instead of the job vacancy rate I am using our office’s help wanted index as a stand-in for labor demand and job openings as I have compiled this data back to the 1980s. 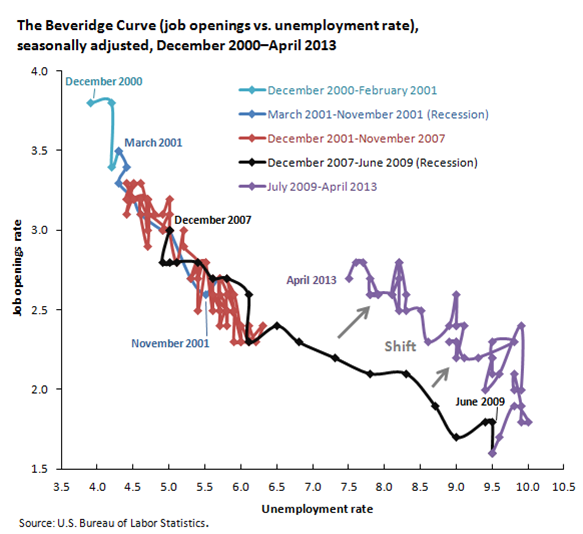 This outward shift in the Beveridge Curve is one indication of structural unemployment and has the subject of much discussion in recent years among economists, researchers and policy makers. However, what Ghayad and Dickens did was disaggregate the Beveridge Curve for a number of different segments of the population to try and learn more about what is causing this outward shift, which does represent a loss of efficiency in the labor market. They were trying to determine it there was any one particular cross-section of the labor market that was impacting the numbers, or if it was widespread. Between Ghayad and Dickens and more recently Kroft et al. the labor market was decomposed by industry, by age, by education levels, by gender, by race, by region of the country and by duration of unemployment. In all but the last of these, the same outward shift for each of these categories or groups was seen in the data. 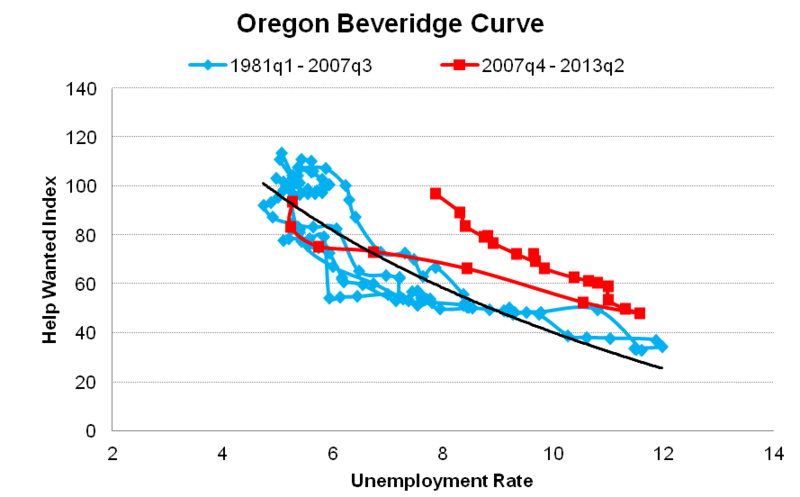 Below are the long-term unemployment shares by various group from Kroft et al. You can clearly see that long-term unemployment rose pretty consistently across all of these groups. However, when examining the differences between the short-term and long-term unemployed, researchers found a pattern. The graph below from Ghayad and Dickens shows the Beveridge Curve for the short-term unemployed on the left and the long-term unemployed on the right. For the short-term, there is no apparent shift, indicating that they are being reintegrated into employment in-line with the historical patterns and therefore the labor market is functioning — at least at a first approximation — relatively normal for those unemployed only a short time. For the long-term unemployed, there has not been much progress made at all. Up until late last year this was not common knowledge among economists, but now is part of our understanding of the economy thanks to Ghayad and Dickens and now Kroft et al. When examining Oregon data, the same general pattern is seen. The labor market is improving in-line with historical patterns for those recently unemployed however progress has been slow for the long-term unemployed. The fact that there remains a large pool of the long-term unemployed can explain the majority of the outward shift the Beveridge Curve and if there is a structural problem in the labor market, it is with these individuals who have been out of work a long time. This is worrisome because to the extent that the skills of displaced workers have become obsolete, permanent damage has been done to Oregon’s growth potential. Ensuring that individuals who have been out of work for an extended period of time remain a part of the labor force, and do not see their skills and productivity erode, is a challenge. However there are at least two silver linings to this research. One, this potentially structural issue is an issue of the duration of unemployment not due to any one particular aspect of the economy, e.g. construction workers. Why is this a silver lining? The fact that it is more of a general malaise indicates that if the economy can gain some momentum and produce stronger growth, then the number of long-term unemployed should fall for good reasons as more jobs become available. Secondly, on the upside, reintegrating the long-term unemployed and/or an increase in the labor force participation rate represent a potential boon to the economy. As job opportunities become relatively more plentiful, some discouraged workers will reenter the labor market. Additional individuals working results in more household income and cheaper labor for firms, producing a strong positive feedback cycle. The effects of long-term unemployment extend beyond income loss. The majority of people in this group — 55 percent — are men . They are also more likely to remain unemployed because the industries that are male dominated (manufacturing and construction) have recovered the least and where companies are investing more in automation than in increasing their labor force. Men are also more ill equipped to deal with the consequences of long periods of unemployment than women. They are more prone to turn to excessive drinking, drug abuse, domestic violence, and crime. So discrimination by employers creates problems that extend far beyond the loss of income.